← Did She Die in Vain? I first met Anthony Smith a good few years ago when he was a student on the long since disappeared Postgraduate Diploma in Antiquarian Bookselling course we used to run in conjunction with the School of Library, Archive and Information Studies (SLAIS) at London University. A course long since disappeared, although we hope to reintroduce something similar before too long in a collaboration between the London Rare Books School, the ABA, and those involved in the History of the Book masters course run at the Institute of English Studies (watch this space). Prior to that, his grounding in the book-trade had begun with a holiday job at Hall’s Bookshop in Tunbridge Wells (now of course owned by Adrian Harrington – see Deck the Halls below). 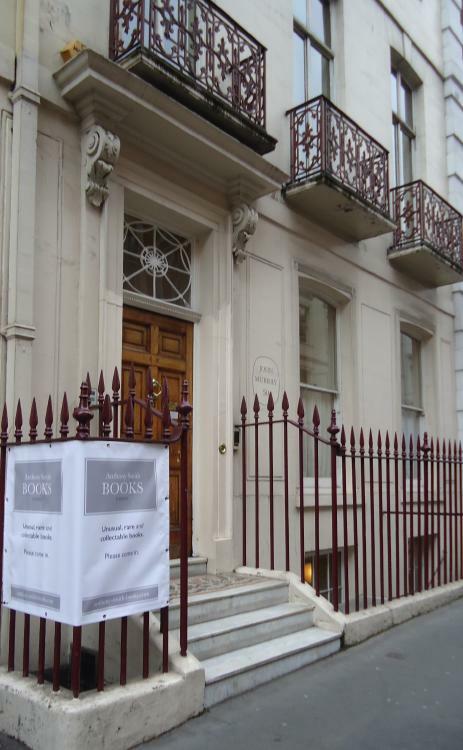 A work placement at Heywood Hill in Curzon Street, long one of the most stylish and fashionable bookshops in the world, led directly to his being offered a full-time position. After a long, successful and happy stint there, lasting some fifteen years, he moved on to look after the bookselling side of Slightly Foxed in South Kensington, another stylish and fashionable shop, its business underpinned by the thousands of subscribers to the elegant literary quarterly of the same name. Astonishing in a way, when the world believes that all such things have moved online, that shops like these (and a printed literary quarterly) can thrive and prosper, but so it is. And it’s important that they do. It is after all bookshops that create book-collectors – there’s nothing remotely like a tangible encounter with the real thing to provide the spark. Anthony has now decided to draw on all that accumulated knowledge and experience to start up on his own – Anthony Smith Books. He’ll work from home and online, issuing catalogues, but he’s always been a bookshop bookseller and he’s started his new venture with the vogueish experiment of a pop-up bookshop. 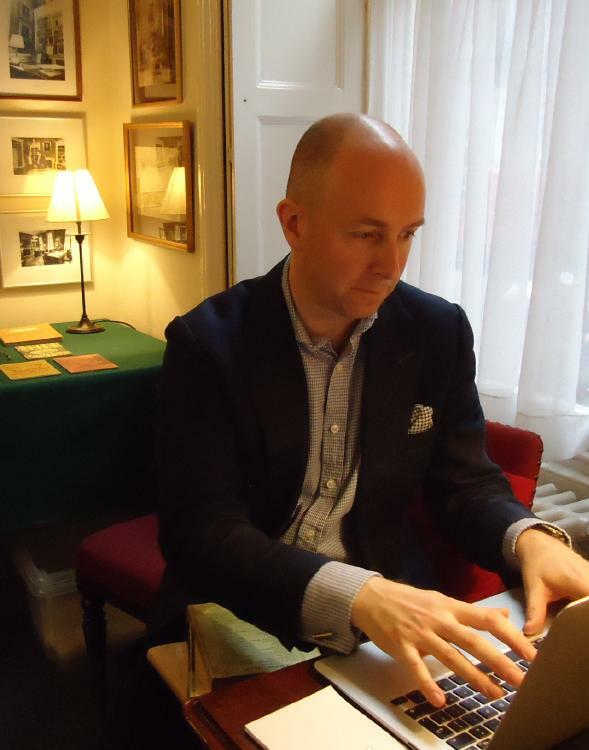 I found him this morning in rather august surroundings – the front room of 50 Albermarle Street – the home of course of the publishing house of John Murray since about 1812. The very house in which Byron’s unpublishable memoirs were burnt in the fireplace upstairs, the very house of the publishers of Jane Austen, Samuel Taylor Coleridge, David Livingstone, Charles Darwin and so many more besides. Difficult to think of a more suitable location – and it all seemed to be working well when I wandered in. Visitors, much interest, admiration, purchases, offers of books, and goodwill all round – and I suppose nothing sharpens the mind to a purchase quite so much as the knowledge that the ‘shop’ won’t be there the next day. It’s a nicely chosen stock – mainly, although not exclusively, twentieth-century literature – including both some important books and some very notable scarcities. I certainly found a few things to buy – books I haven’t had (or even seen) in quite a long while. Anthony’s planning to repeat the exercise – perhaps a two-day pop-up every couple of months rather than a single day each month – but he needs (as we all do) to find his rhythm and a workable timetable of fresh acquisition, quotidian cataloguing, and putting the books into a shop-window (either online, in print, or in a temporary display like this one). It’s an intriguing experiment, but one that looks as if it has every possibility of working. Let us hope it does – it deserves to – it’s a splendid way of reaching out to new customers and perhaps too the sort of customers who don’t habitually haunt second-hand bookshops. 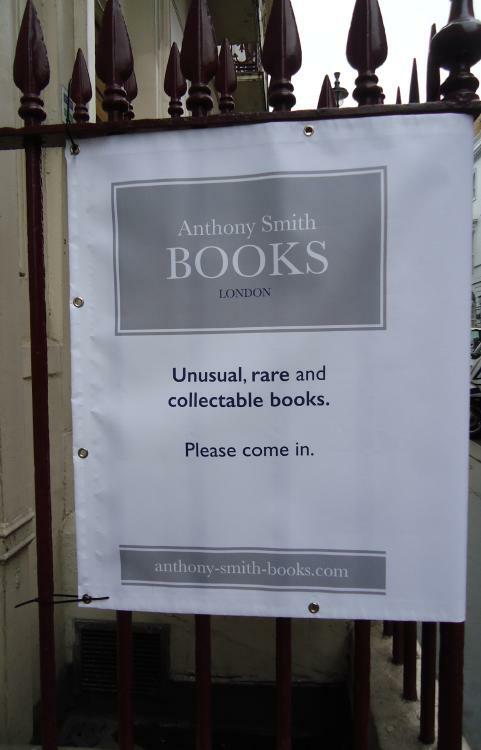 Anthony’s website with an online shop goes live next Monday (23rd March 2015) – http://anthony-smith-books.com/ – so you can all vie in being the very first to buy something from it. You won’t of course be able to buy the books I’ve already bought: as I have said before, the best books rarely make it to life online (cultivate a bookseller who will give you first refusal). I wish him every success – he deserves it. 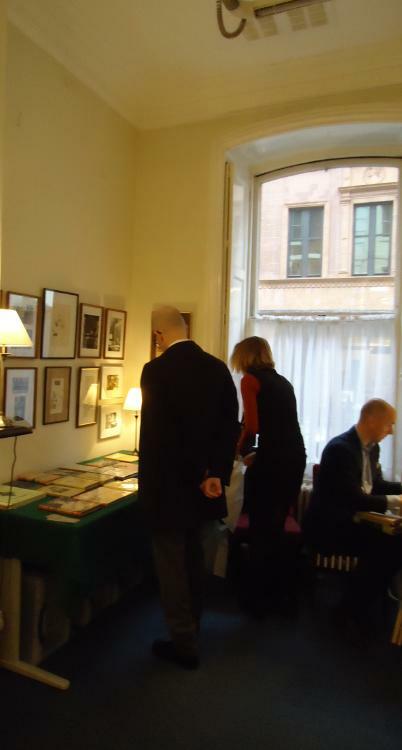 It’s the same kind of innovative thinking that lies behind the rolling worldwide pop-up bookfair planned by the International League of Antiquarian Booksellers (see World Rare Book Day below). Here in London we shall be taking part with a pop-up bookfair in the rarified surroundings of the Middle Temple Library. Quite literally a pop-up, rare books available to buy in just a two-hour window at lunchtime (Middle Temple Library Central Concourse, 12-2pm, Wednesday 23rd April 2015). And as well as trying to reach out to the wider world and proffer strangers the chance of their first encounter with a rare and collectable book they can actually buy and own, we shall be raising charity funds for UNESCO literacy projects too. It will be fascinating to see how it all works out. Put it in your diary, I shall see you there. This entry was posted in Book Collecting, Booksellers and tagged Anthony Smith, ILAB, Middle Temple Library, Pop-Up Bookshops, UNESCO. Bookmark the permalink.